February 27, 2009 | The Utah State University Student Lobbyists continued their diplomatic assault on the Legislature on Wednesday as they gained the audience of both the president of the Senate and the speaker of the House and presented each with a copy of a campus-wide petition opposing further budget cuts to the university. The group, consisting of 11 students from the departments of political science and journalism, met with President Michael G. Waddoups (R-West Jordan), and Speaker David Clark (R-St. George) and laid out the concerns of students. Accompanying them was a petition that had been in circulation since the beginning of the spring semester containing 4,936 signatures. "Our message is not one of anger or of bitterness. Rather it is one of concern and optimism. We do not seek immunity from the economic challenges our state faces; we simply ask that we be treated fairly. We ask that the state lawmakers be prudent and thoughtful as they execute the difficult balancing act that must occur to stabilize our state economy." The campaign against higher education budget cuts began back in September, Chris Neil, a member of the USU student lobbyists said. The group had lecturers and guest speakers come and help prepare them to lobby their state legislators. The news of higher education budget cuts emerged around the same time, and according to Neil, that's when things started to happen. "It didn't take long for us to take action on the issue," Neil said. We began mobilizing and organizing ourselves almost immediately once we heard about the 4 percent cut." The USU Student Lobbyists, in conjunction with the Government Relations Council, have been responsible for several events and efforts to reduce budget cuts to the university. According to Neil, over a thousand letters have been written by students to their state representatives and senators. Neil added that hundreds of letters to the editor have been published in every major newspaper in the state. "It just goes to show that students really care about this issue," Neil said. "We're not as apathetic as people think. The state legislature needs to realize that, and realize that we're not just going to sit by while these budget cuts cut into our future. 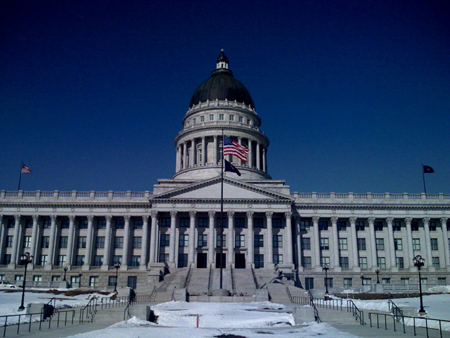 It was this same organization that organized two notable rallies ­ one at Utah State University featuring speeches from Professor Pat Lambert from the department of anthropology and USU President Stan Albrecht, and the other on the steps of the Utah Capitol featuring remarks from six state lawmakers and Scott Wyatt, former state representative and current president of Snow College. The success or failure of the efforts of the USU Student Lobbyists and other like-minded groups will shortly be determined as the legislative session heads into its last two weeks. State lawmakers are scrambling to pass a balanced budget and are less than optimistic that higher education will be spared from large scale budget cuts.